08.05.12 Vancouver, Washington, August 4: Today was an unusual day in the Pacific Northwest- it was hot. In an area known for its cool, cloudy weather, having 100% sunshine and a high temperature of 102 is certainly unusual. After a day of sight seeing in Portland, which included a visit to Powell's, the country's largest independent bookstore, it was time to turn to the reason we came here--chess. 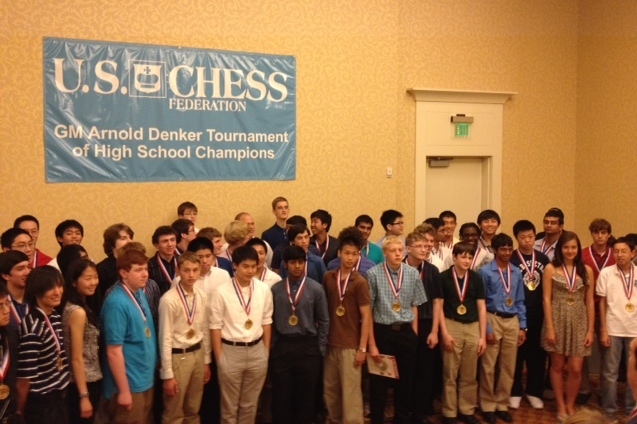 A group photo of the participants in the Denker Tournament of High School Champions. The Denker and Barber tournaments kicked off at 3:00 PM with lengthy but well intentioned opening ceremonies. Each of the 95 high school and middle school state champions received medals commemorating their participation, and a meaningful gift. The Denker participants received a DVD featuring all of GM Denker's games, plus a recently discovered unpublished mongraph written by Denker, presented by his son Mitchell. The participants then gathered for group photographs. In the Denker, Cape Elizabeth's Brett Parker (USCF 1620) was paired against Michael Omori (2171), the representative of host state Washington. The Denker field is extraordinary, featuring 25 experts, 13 of whom are Masters. 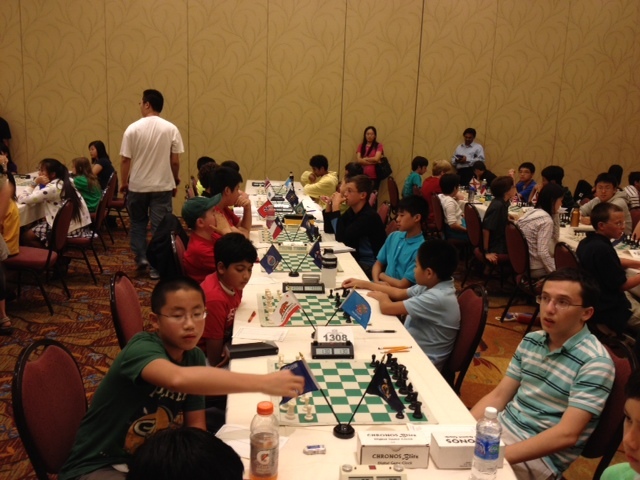 The highest rated player is 15 year old Darwin Yang of Texas, who has a USCF rating of 2594, and has completed 2 of 3 GM norms. Playing the white pieces, Brett used the Polish defense, which confused his higher rated opponent, and led to a 3 1/2 hour battle. However, in the end Omori prevailed. In the Barber, the field is also very strong, with 16 experts, and three Masters. Maine's Matthew Fishbein (2108) is the 8th seed, and was paired in Round 1 against Wisconsin's Tinglin Shi (1705) who proved that any player who can win the right to represent their state is a tough competitor. After Matthew gained positional advantage, Tinglin forced an exchange of queens and rooks, leaving both players with a pair of bishops and 5 pawns. 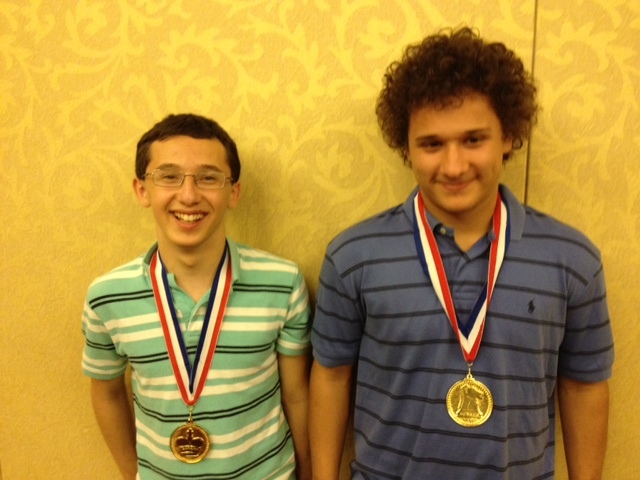 However, Matthew found himself with two isolated pawns, and the rep from the Badger state adeptly played the end game until it was a clear win, and Matthew resigned. There were a number of other upsets in Round 1, including the highest rated player Andrew Tang (2253) of Minnesota falling to Arthur Tang (1853) of New Hampshire. There are two rounds tomorrow, with lots of opportunity for all, regardless of how Round 1 turned out. Matthew Fishbein provides notes to his first round game. 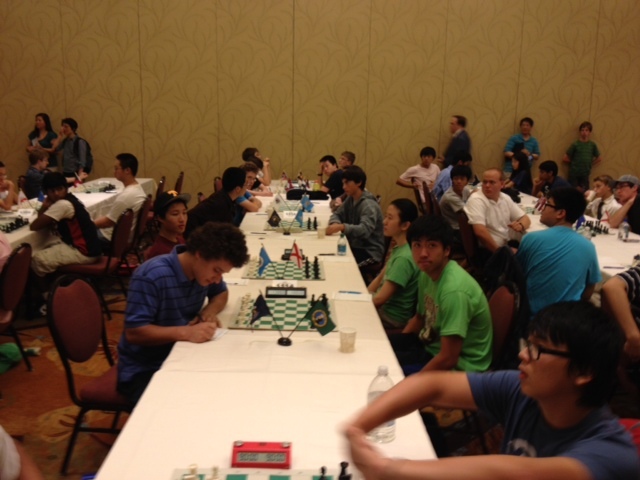 Matthew Fishbein (right) prepares for his first round game with Wisconsin's Tinglin Shi. Brett Parker (left) does the same before his first round game with Michael Omori. •Saturday [4 August] - Opening Ceremony at 3:00 PM. •Saturday [4 August] - Round One at 7:00 PM. •Sunday [5 August] - Round Two at 12 NOON. •Sunday [5 August] - Round Three at 7:00 PM. •Monday [6 August] - Round Four at 12 NOON. •Monday [6 August] - Round Five at 7:00 PM. •Tuesday [7 August] - Round Six at 11:00 AM. •Tuesday [7 August] - Denker Awards Ceremony at 4:00 PM.